"Those shoes are going to Africa when the show's over"
Mr Monkey scampered up to the gallery floors of the Cornerhouse. He had to wait for a few minutes while Mr Rik borrowed some used shoes from Adam Chodzko. 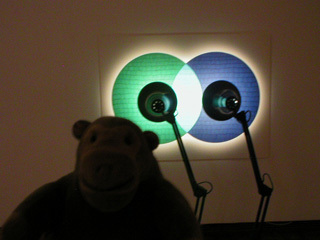 On the next floor up, Mr Monkey discovered that there was something tricksy about green + blue = cyan by Anna Barriball.